Back in 2005, we visited the Kilauea volcano in Hawaii. There were active lava flows at the time, but the main caldera was only venting gases (this was before the lava lake formed in Halema‘uma‘u). We followed the road around the main caldera, then down to the coast to see where lava flows had obliterated the road and look at active flows waaaay off in the distance. With the current eruption transforming the area, I’ve just uploaded an album to Flickr. You can look at the full-sized images there, or look back at my original blog posts in which I describe the trip. This entry was posted in Travel and tagged Hawaii, Kilauea on June 24, 2018 by Kelson. 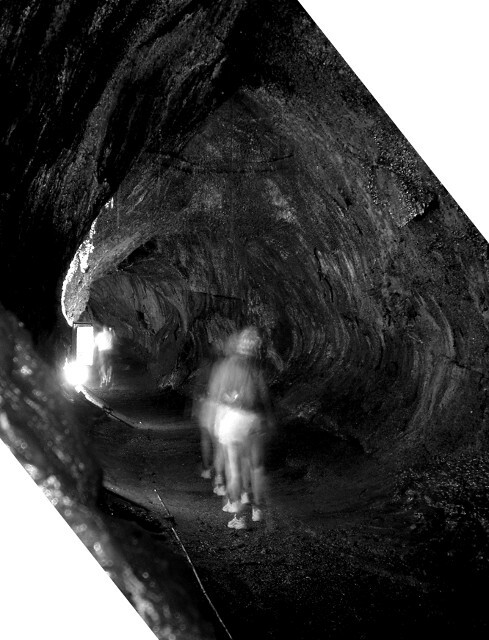 A long exposure shot in Thurston Lava Tube on the big island of Hawaii, capturing ghostly images of people walking through. I originally posted a color version along with other photos from the visit back in 2005, and converted it to black and white for my entry in this week’s photo challenge on WordPress.com. If I’d known it would look so much better in black and white, I would have converted it years ago. This entry was posted in Highlights, Photos and tagged cave, Hawaii, NaBloPoMo, NaBloPoMo 2013 on November 2, 2013 by Kelson. I was a little surprised, but then I saw the “Made in Hawaii” plate holder and realized they were talking about the lunch meat. This entry was posted in Signs of the Times, Spam and tagged Hawaii, license plates on July 14, 2011 by Kelson.